Share Our Strength’s Cooking Matters™ empowers families at risk of hunger with the skills, knowledge and confidence to make healthy and affordable meals. With the help of volunteer culinary and nutrition experts, course participants learn how to select nutritious and low-cost ingredients and prepare them in ways that provide the best nourishment possible to their families. Cooking Matters is nationally sponsored by the ConAgra Foods® Foundation and Walmart. Local sponsorship opportunities are available. Since 1993, Cooking Matters (formerly Share Our Strength’s Operation Frontline®) has grown to serve more than 11,000 families each year across the country, helping them learn how to eat better on a budget. Today, 85 percent of Cooking Matters participants graduate, taking with them improved nutrition practices, eating habits, and food budgeting skills. Cooking Matters has received special recognition from the U.S. Department of Agriculture for excellence in nutrition education. The program was also featured by First Lady Michelle Obama’s Let's Move campaign, a nationwide initiative dedicated to raising a healthier generation of kids. For more information, visit CookingMatters.org. Classes are offered from Nyack to Albany. 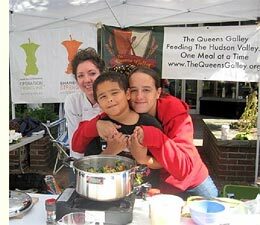 For information on Hudson Valley Cooking Matters classes, please contact Jeanine Lindhorst, Queens Galley Cooking Matters Coordinator.